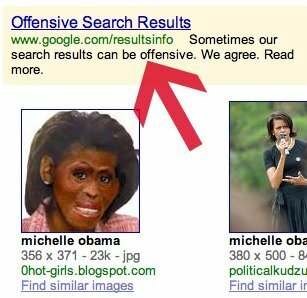 If you search on for [Michelle Obama] in Google Image Search you will see a racist and offensive image of the US first lady. Seroundtable first reported this image back in ten days ago and then gave Google a hard time for removing the Obama result. Well, the result is now back, hosted on a new site. But this time, Google bought a search ad explaining why the result is there and why Google cannot remove it. Personally, I disapprove and would be happy if Google were to remove such an offensive image. The discussion on Google Forum also echo’s my sentiments. UPDATE: Google apologizes for offensive first lady image. Yes it’s disturbing. All Presidents and their families are subjected to this and other sorts of punishment. Why should Obama be treated any different. Far worse has been published pretaining to the Palin family. Liberals painted Condoleezza Rice and Colin Powell as Uncle Tom’s and FAR worse. It would be racist to protect Obama and not the others who are subjected to the same kind of humility. No one, should be portrayed that way regardless of if it has been done before or not, there comes a time when that kind of racial stereotype is no longer funny, and should not be tolerated under any circumstances. Now it’s that time. Its a weak argument to say something that is clearly wrong in so many levels should be accepted simply because its been done before. Its not about protecting the Obamas of the world, its about setting a better example for the younger generation, than that which we were given. Why blame Google? If you have a problem with the content, contact the owner of the indexed site. Although I think it’s a pretty horrible image, I agree with David. Contact the owners of the indexed site. Google should not be in the business of censoring, just indexing. While I find this image reprehensible and infuriating I do NOT want Google (or anyone else for that matter) to become the watchdog for what I am allowed or not allowed to see. I don’t have a solution but censorship is NOT it. poor babies are offended lol, how is it racist? All I see in those photos above are two black women, while not PC it is not racist!